We've got cowboys, they've got rovers. We've got ranches, they've got stations. We've got biscuits, they've got damper. There are a lot of similarities between the U.S. and Australia when it comes to raising cattle - except for the vocabulary. When I was at the Fancy Food Show I came across a booth of Australian products. I started up a conversation with Michael because I have Aussie cousins and also because I was hoping he might be a purveyor of some of the new Aussie spices coming out of the Outback (such as wattleseed). He didn't have any spices, but he did offer me a sample of their Taste of the Outback damper mix. I took it happily and went on my way. A couple weeks went by and then I thought of the damper mix and looked up some info on the internet. 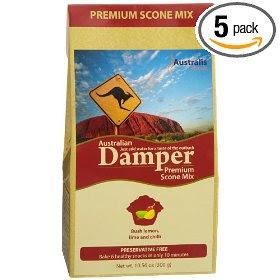 Basically damper is the equivalent of biscuits. When the rovers were out on the trails they often had to just make biscuits by mixing flour and water and throwing it into the ash of the campfire to cook. The difference from our biscuits seems to be only in the amount of mixing done. Biscuits are barely mixed in order to get a flaky texture. Damper is kneaded more and is more bready. 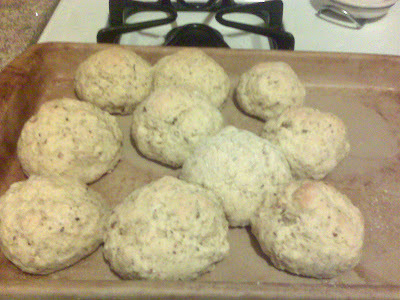 The instructions said to portion the dough into muffin tins but I was looking for more biscuit-like/scone-like and so I just made globs of the dough and put them on my baking stone. The mix I was given was bush lemon, lime, and chili. Bush lemons have to be hardy to grow in the Outback and have a very thick skin. It was a savory scone, - much more than I anticipated! They were quite flavorful with the spice and would make an excellent side to a bowl of chili instead of cornbread. So I decided to save them and threw them into the freezer to keep for a chili day. I'm not sure what stores locally might carry it, but you can buy it online via their site or Amazon at this link.